Just watched the teams and class notebook videos. Thanks. I was using One note classroom last year for A level economics. I got increasingly fed up with having to distribute the pages for assignments as it took ages to upload x x number of students. Then in December I learn MS are no longer support One Note and that I need to use Teams. So just looking at teams today. I like the assignment feature a lot. although I can’t seem to have the marking flexibility anymore. Why would I keep using classroom going forward as it seems I can collaborate, share files, assign work like before all in teams. Your thoughts? Thank you for your comment. Microsoft no longer support Microsoft Classroom. You can continue to use OneNote Class Notebook but these exist automatically in Teams. You are right, class notebook provided a nice flexible approach to assignments where as Assignments in Teams is a more formal structured way of marking work. Have you tried using a combination of the two? 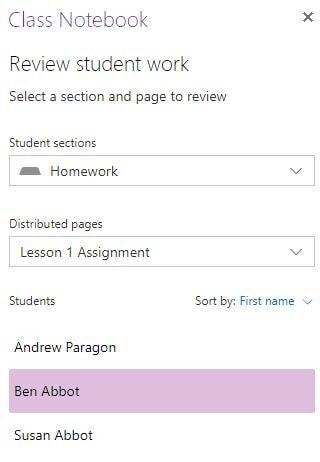 You can set and assignment in teams and select a class notebook page. This will then be distributed to all students in Class notebook and you can formally mark it in Assignments but still have the flexibility to comment and write on student work in the notebook. I will try and do a video on this at some point!